I’m going to let you in on a secret. I was pretty nervous to start this blog. I wasn’t so much worried about people not liking it. I figure those who don’t like it won’t read it. I was mostly nervous about failing. I had no idea if I would enjoy blogging. And I knew if I didn’t enjoy it, I wouldn’t be able to stick with it. I was scared that I would lose interest, or energy, or ideas, and give up. Halifax Dogventures would be relegated to the same dusty shelf as countless other abandoned blogs. So I set a goal: one blog post a week for 52 weeks. So far, sticking with my goal has been easy. And so much fun. I think it’s because I have a subject I genuinely get excited about. Dogs + exploring = the best. Going on our weekly dogventures and sharing them with all of you has become a highlight of my week. Don’t start a blog for the sake of starting a blog. Start one because you have something you’re dying to say. In terms of this blog’s topic – dog-friendly places in Halifax – it definitely helps to live in a city with an abundance of places to explore. I still can’t get over the quantity and quality of parks, trails and other dog-friendly destinations in HRM. Take, for example, the Dartmouth Harbourwalk. 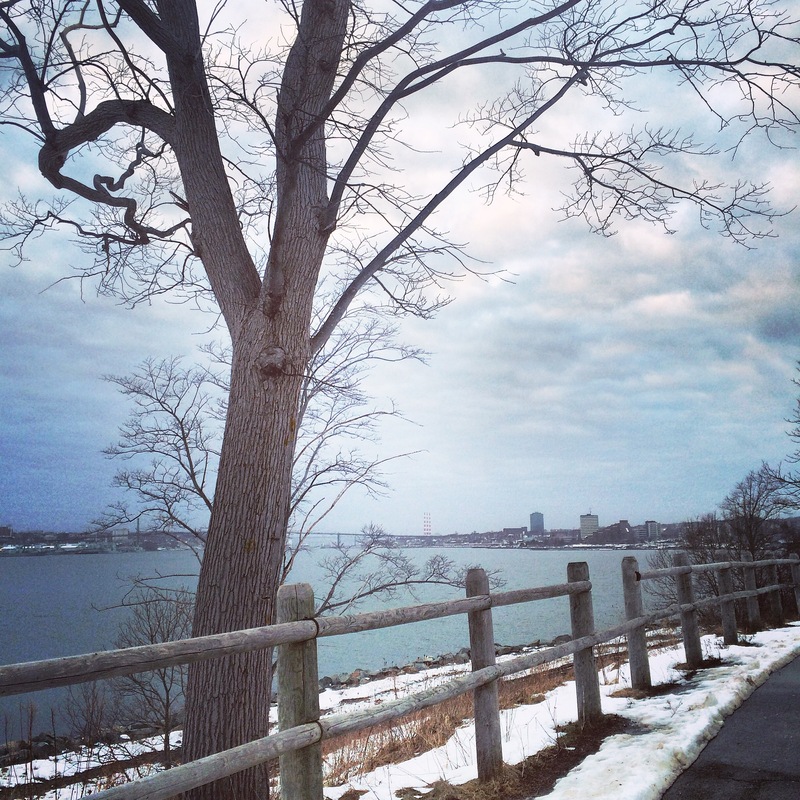 Did you know there is a picturesque, paved trail running along the Dartmouth waterfront from the Alderney Ferry Terminal to the Woodside Ferry Terminal? I didn’t, and I walk by the Woodside end of this trail every single day. When I finally took notice of this big, obvious sign right in front of the Woodside Ferry Terminal, the Dartmouth Harbourwalk jumped to the top of my list of places to check out. 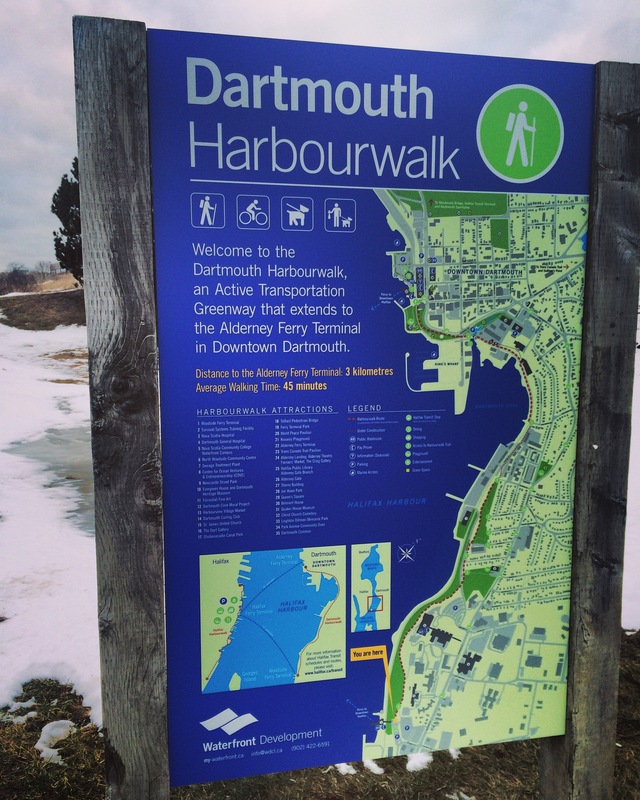 First of all, I love that the Dartmouth Harbourwalk is considered an “active transportation greenway”. Wouldn’t a walk or bike ride along the waterfront make for a pretty great commute? We started at the Woodside end of the trail. I didn’t feel too guilty parking in the (free) Woodside Ferry Terminal parking lot (which is designated for ferry passengers only) because I had taken the ferry to and from work that day, and the lot had already emptied out. But beware: on weekdays the lot tends to fill up around 8:00am. Although it wasn’t a bright and sunny day, we enjoyed strolling along the trail and watching the ferries dart back and forth across the Harbour. While we strolled, I concluded that the Dartmouth Harbourwalk would make for a perfect jogging route. It’s paved and well-marked, it has a few rolling ups and downs, and it doesn’t appear to be heavily used. The 6-kilometre roundtrip (3 kilometers each way) would be the perfect distance for a non-serious runner such as myself and a gradually slowing down black lab. We didn’t make it to the other end of the trail (the Alderney end) this time, but we look forward to checking it out… and you better believe we’ll be hitting up the Dartmouth Farmers’ Market at Alderney Landing while we’re at it. Who couldn’t use another stunning print from Sarah Duggan Creative Works? I’m so glad you took the plunge and started this blog! I love reading your posts each week. This week’s Dartmouth Harbourwalk looks beautiful! and it almost looks like it’s spring….